When you deploy App-V applications on laptops and pc's, expect a lot of helpdesk calls. One of the things that you will find out early on when actual users start working with App-V, is that sometimes they manually need to reset, preload and refresh their virtualized applications. 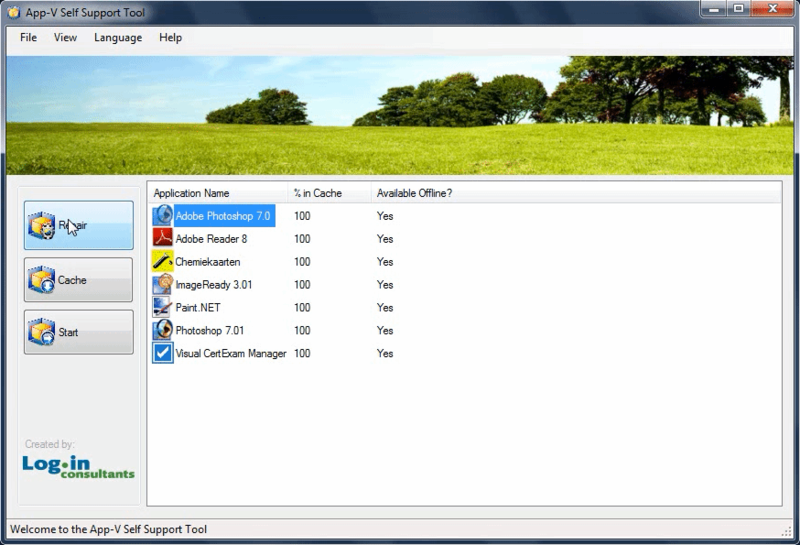 As a result, you will need to give users access to the App-V client MMC plug-in. The problem is, the MMC is typically off-limits for normal users in the enterprise because of security policies on desktops and laptops. And even when users have access, try explaining non-technical users how to work with the App-V client MMC plug-in. The App-V client configuration is simply way too clunky for normal users. This is why Rodney Medina and Peter Nap, my colleague from Login Consultants with some decent coding skills and smart ideas, decided to develop a light-weight, super user friendly tool which does not require MMC access. This App-V Self Support Tool consists of a single .exe (App-V SST.exe) and a XML config file (App-VSelfSupportTool_settings.xml). Just copy these to the PC/Laptops and make sure user can access the tool through a shortcut on the desktop or start menu. You can change the banner to your liking and the other languages can easily added in the XML file. The interface is deliberately simplified, so users can find their way around. There are only a few options: View, Language, Repair, Cache, Start and Refresh. Users do not need anything more, and more importantly, they are not required to ask the helpdesk to support them. The tool is so simple, documentation is overkill. All information you need is condensed into a 5 minute video included in the download. The App-V Self Support Tool is free and available in the tools download section of www.loginconsultants.com (registration required).